Two years ago, I had taken a history course at Western Connecticut State University taught by Dr. Maryanne Rossi called: "Building America." The class' final assignment was to select a topic and conduct primary research on a historic landmark, home, or municipal building that had been impacted by neighboring construction projects, real estate policies, abandoned, or had been weather damaged. My pick was my family's 1783 colonial home in Danbury, Connecticut that sits at the southeast end of Candlewood Lake in between Danbury Town Park and Great Plain Road. Establishing the age of the chestnut post and beam structure would be interesting information to have, but learning about who had lived under that roof would also be interesting. My written proposal was accepted, and I tried a series of different approaches to find information online. I never came across an authoritative and reliable source to verify the home’s date or history. What I did find, however, were newspaper articles and land deeds on neighboring properties in the Great Plain and Aqua Vista districts; two of which referenced Connecticut Light and Power Company's (CL&P) "Rocky River Basin Project". So off I went mining this vein of information. I discovered a fascinating trove of information on what led to the building of this very large lake, and the Rocky River construction project in general. I had not known that the creation of Candlewood was at the time one the largest projects of its kind resulting in the largest lake in the State. I also learned that construction of the Rocky River system had been completed with unprecedented speed, especially for the late 1920s. The history of Candlewood Lake is one that is rich in stories, and it touches five Connecticut towns: Danbury, Brookfield, New Fairfield, New Milford, and Sherman. CL&P's Candlewood project forever transformed the communities surrounding the Lake. How people felt about and coped with the transformation was what first peaked my interest as a history student. 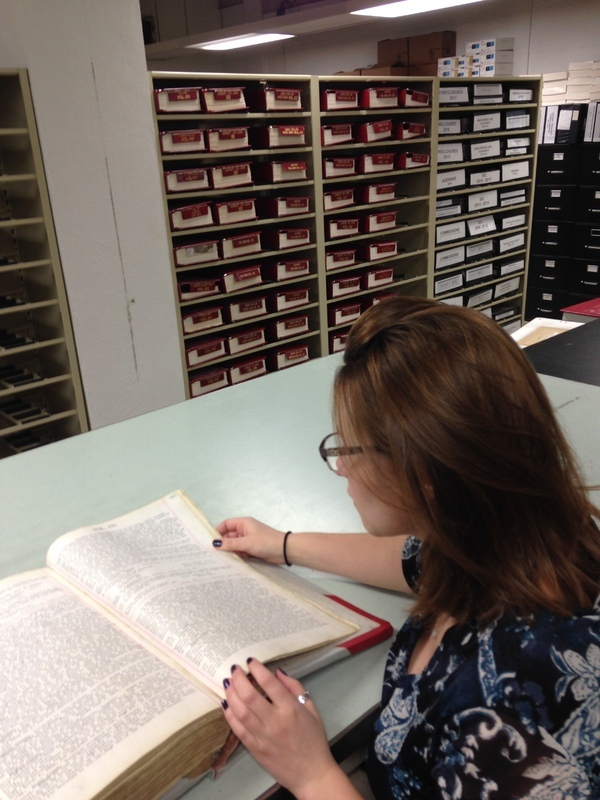 While my project for Dr. Rossi's class started me off, the Herbert Janick Archival Fellow at WCSU, afforded an opportunity to expand upon the original research I had done on my family home and much more deeply investigate the evolution of the CL&P's Rocky River Basin hydroelectric power project. One of the first things I saw when undertaking the Janick Fellowship was a U.S. Geological Survey map showing stonewalls, elevation levels, properties and old connecting roadways. CL&P utilized this map to outline those properties it needed to buy to construct the Lake; could we go out on the Lake with a GoPro camera to capture images of the stone walls or the old connecting roadways? Could we find out more about who profited from land speculation around Candlewood? Could we interview other WestConn faculty about anthropological, ecological and socio-political aspects to the Lake's story? We could... though, we found that we had to scale back some of our expectations because of time constraints. This exhibit is the story of the creation of Connecticut's Candlewood Lake, and also the story of my and the WCSU Archive's research. First, we were able to look at items that related to my research question for Dr. Rossi's class. Very quickly, we found materials to help that research. 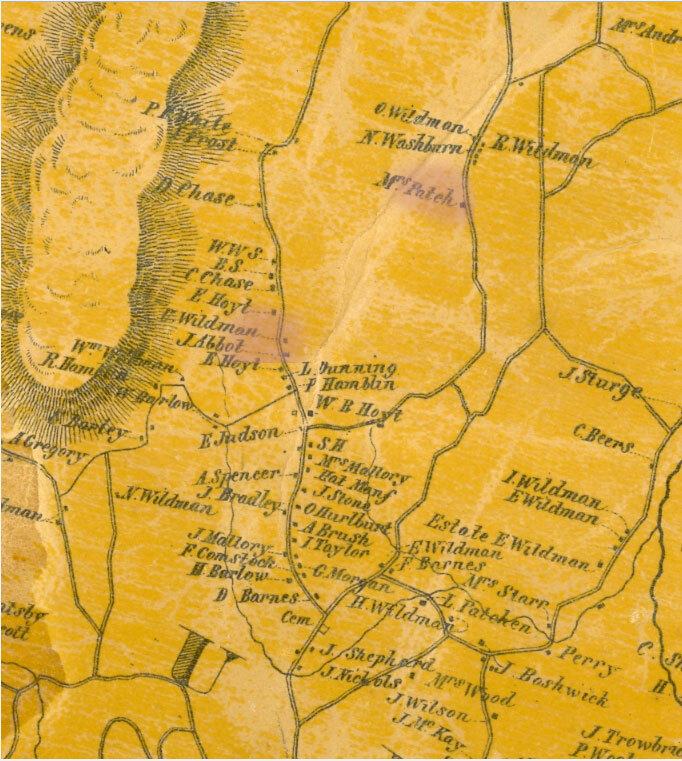 The WCSU Archives has an 1850s Danbury map showing the Great Plain area; we were able to establish that my house had belonged to a John Abbott based on that map. 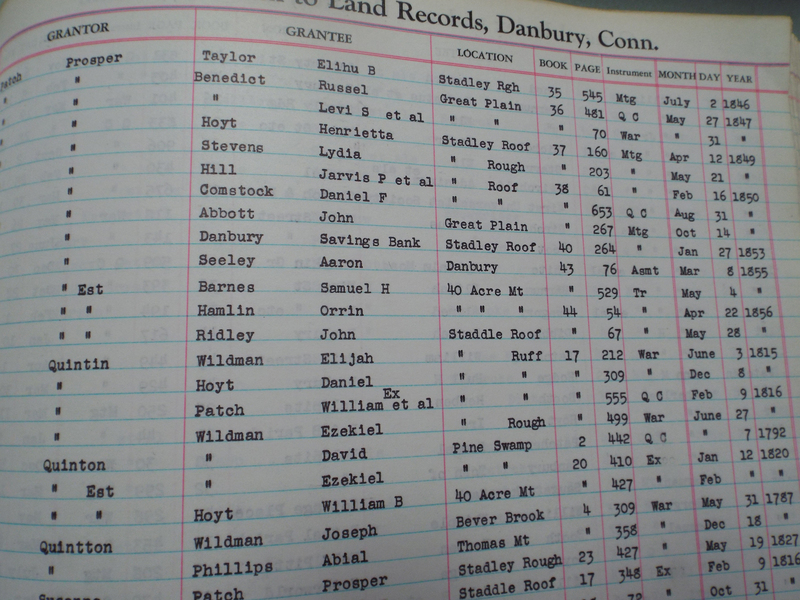 With the Abbott name, at the Danbury City Clerk's office, we were able to find record of Abbott's first purchase of the land. 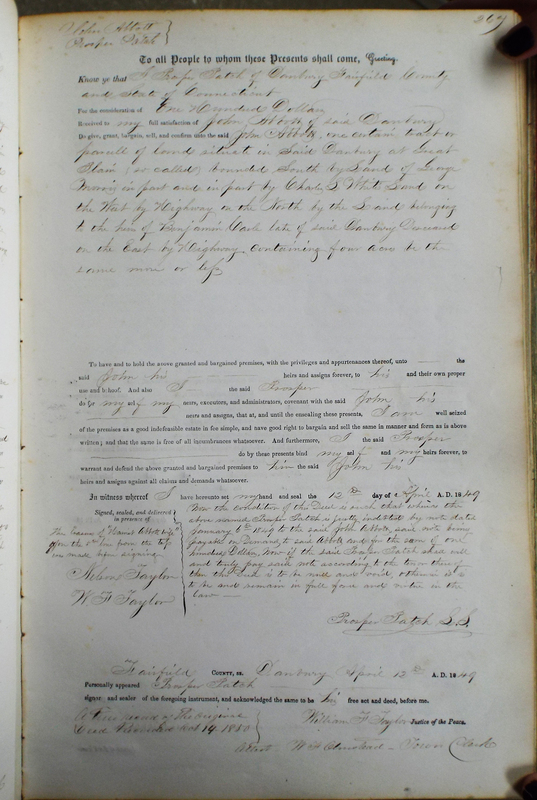 Below you can click to view the land deed transfer between Patch (the original owner of the land) to John Abbott the original owner of my old house. Also below is the grantor-grantee listing between Patch and Abbott.